Millennium 7 Publishing Co.: Dominate YOUR Marketing In Less Time? 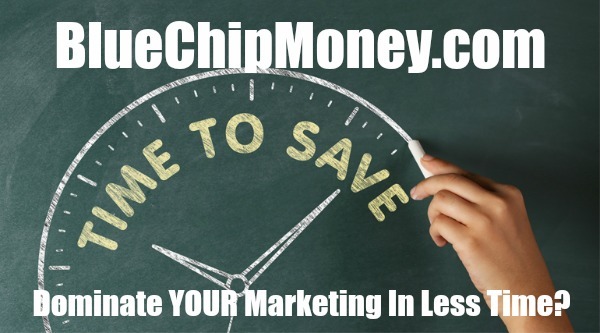 Dominate YOUR Marketing In Less Time? 9 Ways to dominate marketing in less time.. Success often requires getting things done sooner but without cutting corners. Related Article: 7 Ways To Stop Wasting YOUR Time? As an entrepreneur, you're in a Catch-22. If you don't spend time marketing your business, it can't grow. If you spend too much time focused on marketing, you can't develop or enhance the products or services you're selling. How can you get out of this jam? By dominating your marketing in less time. Related Article: YOUR Social Media Time Management Strategy? When you started marketing your business, you undoubtedly felt tempted to blog about whatever was on your mind or share social media content as you saw fit. As you probably know by now, that's not an effective strategy. Is this the content your audience cares about? Are you posting at optimal times? Is your content converting new subscribers or sales? When your marketing strategy doesn't have any rhyme or reason, you can't attribute sales or other outcomes. What's more, if you haven't mapped anything out, how can you be certain you're reaching your goals? You need to take the time to properly launch a marketing campaign. Do some research to determine what kind of content your audience members are looking for and where they spend their time online. Then, you can create an editorial calendar, download a scheduling app and develop a marketing section within your business plan to keep track of what's working and what's not. Although you're spending time mapping out your marketing campaign, think of it as an investment. When you have a plan, your marketing efforts will become more effective and less time-consuming because you'll know exactly where your marketing efforts are going -- without wasting time on a strategy that doesn't work. Related Article: YOUR Social Media Editorial Calendar? Blogging is one of the most effective ways to market your business. It demonstrates that you're not only an industry leader, but also someone who can enhance the lives of his or her target audience. You don't need to spend two hours a day writing blog posts. In fact, because you're an expert who knows what you're talking about, you should be able to crank out a blog post in no time. The reason this isn't happening is because you're writing differently than you think. When it's time to write a blog post, phrase things the way you would while discussing it. Don't worry about impressing people with big words. Just showcase your knowledge while being authentic -- like you do when having a discussion. The same idea can be applied to your social media posts or the answers you share on sites like Quora. You'll notice it won't take long to compose written content. As an added perk, your content be found easier. Algorithms from Google and Facebook look for content with a personal, genuine tone. There's no shortage of tools that can automate your marketing efforts. For example, Infusionsoft streamlines your entire advertising experience by providing a landing page builder, CRM integration, and a campaign builder that will automatically send personalized emails and discounts to hot leads. There's also Zapier and IFTTT, which allow you to automate actions like sharing a WordPress blog post to Facebook or monitoring YouTube for relevant videos to share on Twitter. Buffer, Hootsuite and Post Planner allow you to manage your social media posts, as well as schedule content in advance. Although automation can save you a lot of time, there needs to be a human touch involved with your marketing. Instead of doing this yourself, consider outsourcing or delegating content creation. For example, ask your team to snap photos throughout the day and post them to Instagram to give your audience a behind-the-scenes look. For blog content, you could hire a freelance writer who has experience writing about your industry. There's a misconception that when it comes to marketing, you need to be everywhere. The truth is that it doesn't make sense to spend the time and money on channels and platforms your audience doesn't visit. For example, if you're targeting a Millennial audience, you would want to focus on Snapchat, Instagram and Twitter rather than spend time on LinkedIn or radio ads. By narrowing the channels and platforms you use, you'll spend significantly less time marketing -- and you'll see higher conversions because you're only marketing to your target audience, not everyone else. Related Article: Social Media Tools To Improve YOUR Sales? I'm a big fan of batching, or grouping similar tasks together. You're not jumping between various tasks, which ultimately saves you time. For marketing, devote one day a week to scheduling and curating content for the next week and creating a monthly newsletter. You then only have to check in on your efforts every other day as opposed to spending 20 minutes or more on these activities daily. Why spend time on marketing when you can get others to do it for you? The easiest way to do this is though word of mouth from existing customers. If you deliver a high-quality product or service, along with outstanding customer service, your customers will rave about you in person and online. Ask them to leave reviews or testimonials that can be placed on your site or third-party review sites. Launch a referral program or run a social media contest, like asking customers to show how they enjoy using your product to receive a prize. Another option is to team up with another growing business to split marketing responsibilities. Even if you use the tips listed above, you'll have to set aside the time for your content marketing. The good news is that HubSpot has a method for achieving this in just 30 minutes a day. The method assigns 10 minutes to writing blog posts. You may not finish a post in this amount of time. However, if you spent 10 minutes a day writing, you could have a lengthy, high-quality article in less than a week. You can actually write more than you think by setting a timer, eliminating distractions, preparing an outline and not stopping to edit. Then, allot five minutes for updating social media. Use this time to respond to followers and write an engaging post for the day. Research should also take five minutes per day. Doing a small amount of studying and researching each day makes creating content faster and easier. Subscribe to relevant industry newsletters and RSS feeds so content comes to you. Finally, conduct outreach for 10 minutes. Build Twitter lists, and reach out to bloggers who wrote the articles you've enjoyed reading in your feed. All of this is moot if you aren't running analytics on your social channels and website. Analytics will let you know which marketing techniques are working -- and which aren't. This ensures you spend time on what you're doing right, not what you're doing wrong. A growing business may feel like it doesn't have the bandwidth to accommodate marketing, but without marketing, it will stop growing. By taking a few steps to make marketing an incremental effort, you can ensure you get your company's name out without taking time away from the business itself. Guest Authored By John Rampton. John is is an entrepreneur, investor, and startup enthusiast. He is founder of the calendar productivity tool Calendar. Follow John on Twitter. "A growing business may feel like it doesn't have the bandwidth to accommodate marketing, but without marketing, it will stop growing.